These are a wonderful way to class up a formal dining experience in your home. The Barcelona Damask table linens collection features a regal damask design in eight different rich, solid colors. 100% Polyester. Machine wash and dry. Made in China. I bought a damask table cloth with matching napkins. 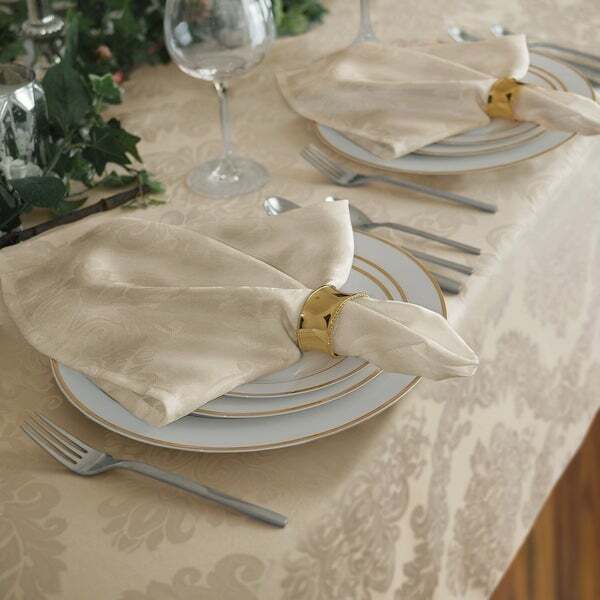 The napkins look elegant and fabric looks nice. It looks as described and perfect for special occasions. Thanks Overstock.com for the quick delivery on these beautiful napkins. I also purchased the matching table cloth for a lunch with the ladies I am hosting. My table is going to look so elegant at such an affordable price. Highly recommend these items to all. You won't be disappointed. Just lovely! These napkins are so elegant. They are perfect for a fancy dinner if you're trying to impress your guests. I bought two packs and the price was just right. I would definitely buy them again. They're shiny, not matte if that's what you're looking for. It's pretty and it matches the tablecloth I ordered, as well as the other accessories already have at home.